Art Deco Buildings: Go Borough! Port Melbourne won the VFL Grand Final today beating age-old rivals Williamstown 22.12.144 to 13.10.88. It's been 29 years since our last premiership and there are a lot of happy people in The Borough tonight. 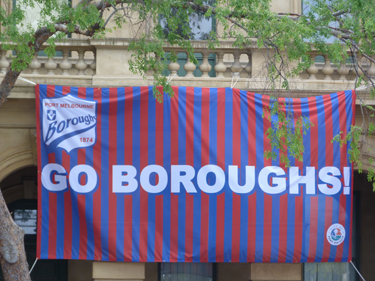 This is one of the banners that the local Council hung on the Port Melbourne Town Hall earlier in the week to celebrate the team reaching the Grand Final. No doubt you are wondering what this has to do with Art Deco, especially since the Town Hall is very clearly a Victorian building, designed by J J Wild and constructed in 1882. 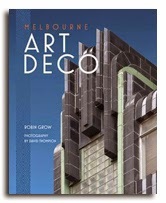 However in the late 1930s, the then Port Melbourne City Engineer, Fred Cook, redesigned the auditorium and Council Chamber in Art Deco style. 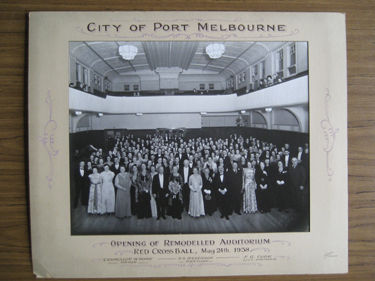 Above is a photo of the Red Cross Ball held for the official opening of the remodelled auditorium on May 24th, 1938. The auditorium has been modified several times since then and sadly little or none of the 1938 hall remains. This ship plaque (below) was salvaged and is now part of the collection of the Port Melbourne Historical & Preservation Society. I mentioned that at the same time Cook also designed the Council Chamber but around the 1960s a false ceiling was put in and the lovely deco ceiling he designed was covered up until several years ago after a severe storm when part of the ceiling collapsed. Here is some detail from Cook's ceiling which I was lucky enough to photograph before it was removed and replaced with a very, very plain, dare I say boring, barrel vaulted Victorian facsimile. I know PMTH is a Victorian building so I can understand the desire to put in a Victorian ceiling but I think there was a very strong reason to retain at least some of the Art Deco. 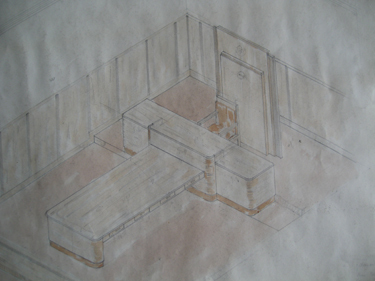 Cook also designed some furniture for the room and this is his original hand-drawn sketch. 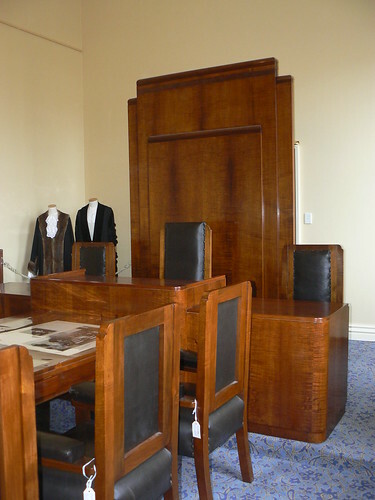 And this furniture still sits in the Council Chamber somewhat at odds with its Victorianised surroundings. I thought it was just another Victorian Town Hall, yet it has quite a history of being altered. I wouldn't mind the ship picture. 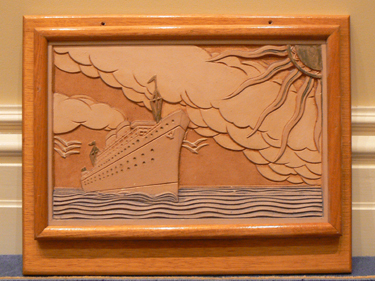 The ship is a plaster plaque and from the few photos that exist of the 1938 version of the PMTH auditorium there were several around the walls. They appear to have all been identical. I'd seen the pics but was thrilled when the onlyone to have survived was donated to the Port Melbourne Historical & Preservation Society. It is so lovely in the flesh and so deco. The clouds and sun are outstanding. It's not very big (maybe 40 x 60 cm) so it would look good in your apartment ... LOL. 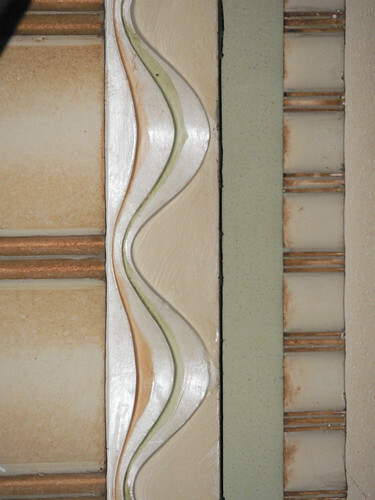 I have been in the town hall's auditorium many times but I don't seem to have any memory of Art Deco style. 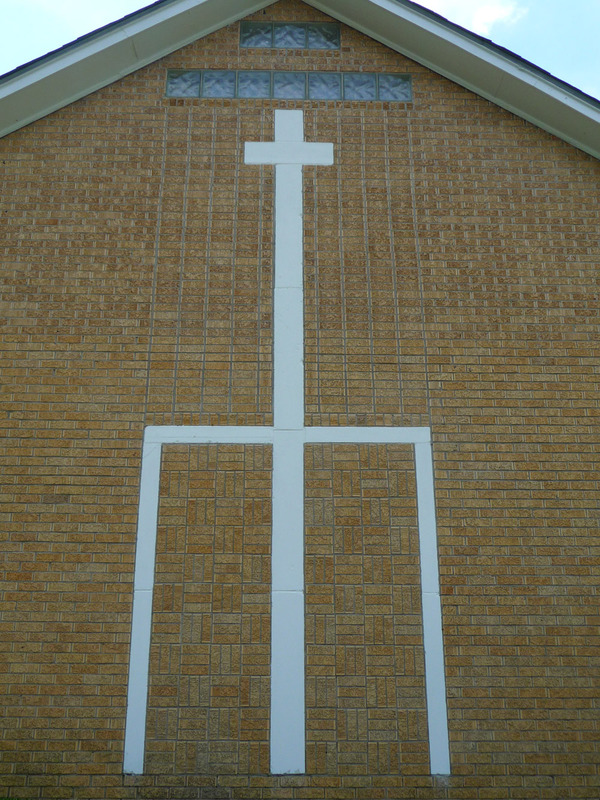 Mind you, in the 1960s I had my mind on things other than architecture :) When was the Deco taken out, do you know? The Council Chamber was probably always a less public space, so it is not surprising that we wouldn't be aware of changes made in that room. I should know Helen but I don't. I suspect it might have been in the 1960s but it could have been as late as the 1980s. LOL I used to know the other Fred Cook that played for Port as I went to school with one of his daughters. Yay on the Premiership and OMG has it really been thatlong?! I saw that Fred Cook at the Grand Final and yes it really is that long. I hope you'll forgive me for saying that Freddie Cook played in the 1980, 81 & 82 premierships and the three before that 74, 76 & 77. He also holds the PMFC games record and goalkicking record. Yeah well, I would certainly like it on my wall, but whether the frame is deco or not, I dislike it and I would have to reframe it. 40cm x 60 is not a bad size and bigger than I thought. There are actually at least two more panels in existence because we have them! My husband and I came across two (unpainted) panels in mirror image in a Violet Town op shop recently. We loved them and snapped them up. I guess they must have been extras, tests or rejects that never made it to the painting stage. I wonder how they came to be so far from home? That's interesting Victoria. If only they could tell their story! Good to know they are in a good home.